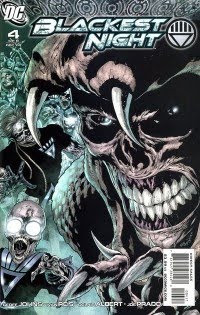 The estimates of Diamond Comic Distributors orders for October 2009 are online here at The Comics Chronicles, and they point to a down month across the board, with double-digit losses in all categories. There was a particularly steep drop of 30% in dollar orders for the Top 100 Trade Paperbacks; DC had Watchmen and a heavily ordered Joker hardcover last October. Comparatives were tough on the comics side, too, with issues of Secret Invasion and Final Crisis topping the charts last October. Dark Avengers is, thus far, not playing the same kind of regular chart-dominating role that we saw Marvel’s stand-alone "event hub" limited series (Civil War, Secret Invasion) playing in recent years. DC, however, is getting mileage from Blackest Night, which helped it take the top six slots on the chart for what is, as suggested here earlier, likely the first time since 1968. There was also much more strength further down the charts last year; the 300th place comic book had orders of around 4,230 copies last October, versus around 2,711 copies this year. This October only had four shipping weeks, versus five last year; the fifth-week effect tends to be an amplifier, allowing an extra high-traffic day for titles releasing in the month as well as increasing the probability that a title will be available for shipping in a given month in the first place. It all added up, again, to a decidedly rough month — with all comics, trade paperbacks, and magazine dollar orders at Diamond down 19%. Still, while this month sent the year-to-date total back into the red, it is only just so — less than $5 million in orders separates this year and last. And the industry is still a full third larger than it was five years ago. While prospects for a flat or slightly up year are looking less likely, the industry would not be down by that much for the year even if November and December followed October’s track. The average comic offered in the Top 300 cost $3.53; the average comic ordered cost $3.46. The median price — the middle price of all 300 comics — was $3.25. $2.99 was also the most common price of comics appearing in the Top 300. The monthly flashback column, looking at past Octobers, will be along soon. Happy Thanksgiving!